August 31, 2015 December 7, 2015 News Leave a comment BBC BerkshireBen NevisBerkshirepaloozaDeli RougeDementiaGlasgowManchesterMatt AllwrightSeven SongsThe BeekeeperWhy Alzheimer's Society? The BBC Berkshirepalooza, Waltzing, Beekeeping and Buddy Holly, but more importantly get in touch now and organise your own Seven Songs. I’ve not told you much about my recent adventures in the homes and gardens across England, Scotland and Wales… and if anyone is reading this from Northern Ireland, I’d love to play there too at some point. 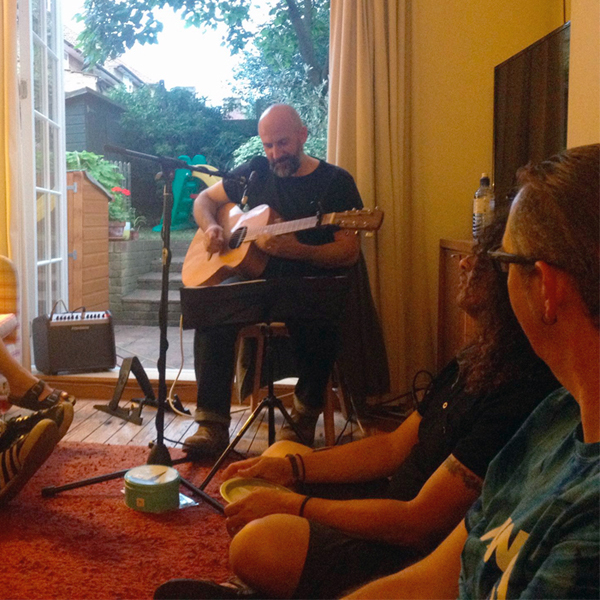 As of September 2015, we’ve played nearly 50 gigs now (or 55 if you include radio and other odds and sods), raised £5300 for Alzheimer’s Society and a couple of other charities on the way, including the Alice Gross Music Trust which I think raised about £700. How about that! I’m really proud of myself but more crucially I’ve met some amazingly generous folk who really have gone out of their way to help Seven Songs, many of them have fathers and mothers and grandparents who are battling with Dementia. 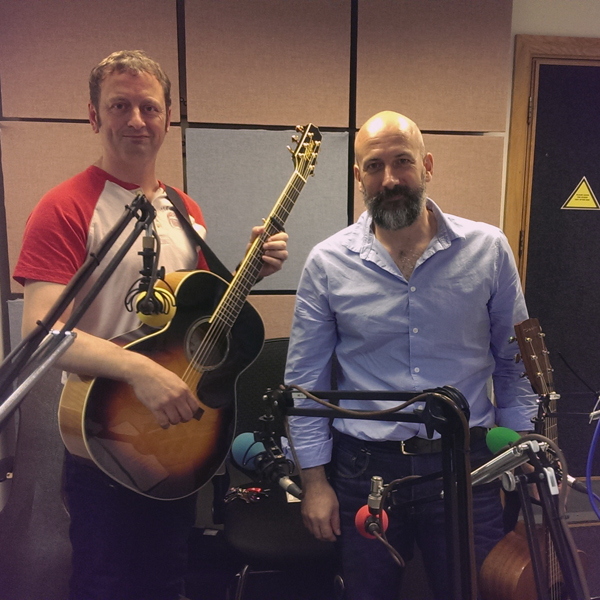 Last weekend we kicked off autumn’s Seven Songs at the BBC Berkshirepalooze on the Matt Allwrights radio show. What a magic day and I’m indebted to Matt and the team for inviting me back. Matt and I played a couple of songs together that we’d been practicing in the Seven Songs Shed. We also accompanied the Reading football legend and Welsh international, Ady Williams, while he sang an unforgettable versions of Buddy Holly’s True Love Ways. It’s very cool to have been part of Ady’s band. Simpson was also in the studio with some of his band- they sang a couple of blinders with a original song and a Maroon 5 mashup. The main bits are around 47mins, 1hr 07mins, 1hr 30mins onwards with the big finale at 1hr 54mins. Anyway enough of me on the radio, what else? Well the last 6 months have been a bit hectic with about 26 or so gigs and lots of highlights… a Manchester tour, another trip to Glasgow and Cardiff and my first Twyford gig. I’ve played in a windy tents using boots to hold down music, during fish and chips for the local Sonning tennis club, in some very tasteful living rooms with some delicious tucker, glorious gardens and a Hawaiian birthday party. 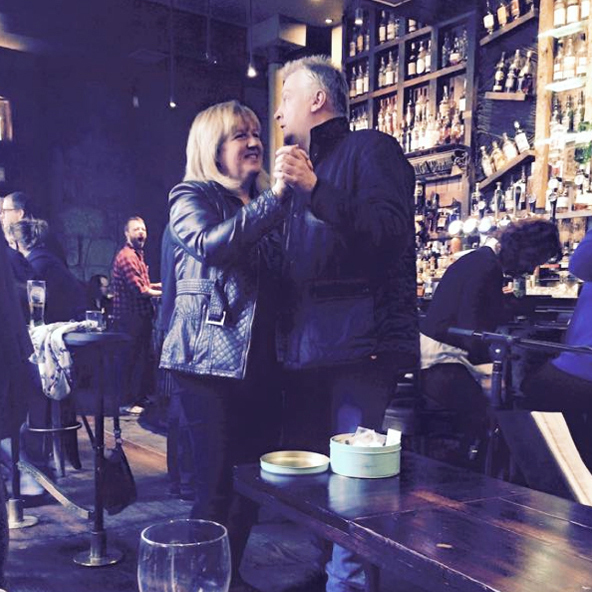 I’ve played to old mates that I’ve not seen for 25 years, met some new friends and had a couple of people dancing! I’ve embarrassingly played to professional musicians, music teachers, and comedians… that all kept me on my toes. 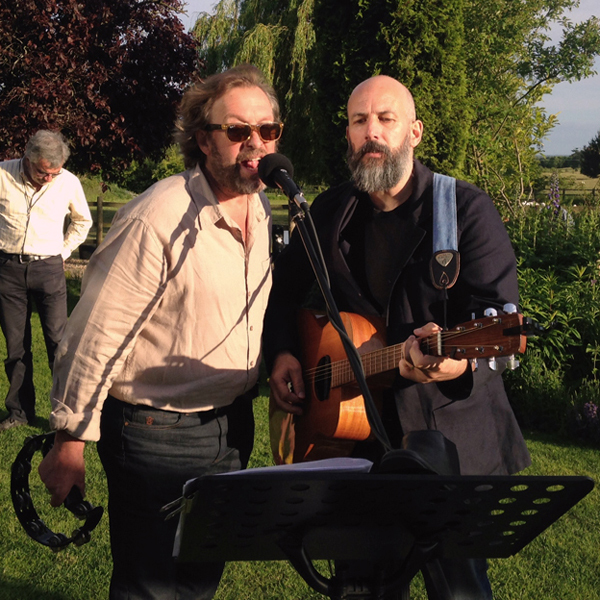 There was a Seven Songs first too, with our local Bee Keeper, Simon singing with me at the local art gallery’s private view (it was his boots holding th e music down). It’s all been slightly nerve wracking but great fun and all for a very important cause; Dementia care and research. Sadly my mother in law died in March, we’d been helping look after her for 8 years (when I say we I mean mainly my wife, Nicky) The threat of dementia to our aging parents, ourselves soon, our children and it’s effect on our future economics is so important that we all need to do a bit. My bit is trying to bring a bit of fun and entertainment into living rooms, kitchens and gardens across the UK and hopefully by giving a bit I will receive something back – by that of course I mean charitable donations either into the Seven Songs cake tin or on my Just Giving account. Coming up this month we’ve got a trip to Sheffield and hopefully we’ll start getting some dates booked in through to Christmas, get in touch please. I’m looking forward to autumn… I’ll learn some new songs, nail the old ones, meet some interesting people, avoid humiliating myself where possible and have some fun. It’ll be fine, I’m getting better. 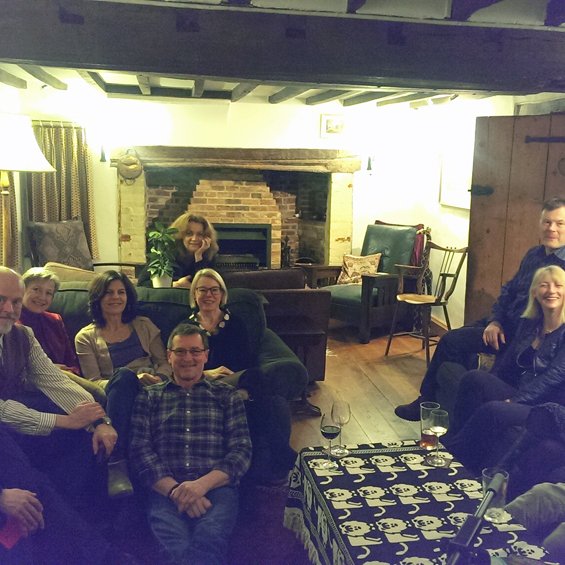 So, as I say, please get in touch if you have a dinner party, barbeque, birthday, book club or if you’re just board of the telly and having a couple of mates round. Or if you just want to do you’re bit to help delete dementia.